Save time by having the offender input some data prior to registration. 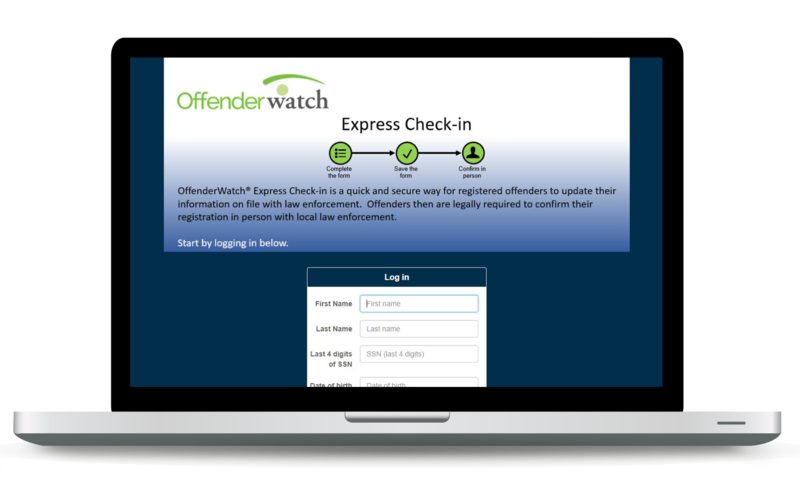 OffenderWatch Express Check-In cuts processing time of re-registration and address updates to a fraction of what it is today by allowing offenders to pre-enter certain data before appearing in front of an officer. Save time – Officers save time entering and editing offender records by having offenders update information ahead of registration. Offenders save time by pre-updating information, receiving reminders of next verification/re-registration date, and printing a receipt to bring to the registering agency. Receive proactive alerts – Officers receive messages when an offender has made an update to his/her file. Access secure database – Officers can also view a list of all offender registration updates in the file that are pending, completed, or expired. Once an officer is satisfied with the data, the file is then applied to the registry database.